A mantra that Blythedale Children’s Hospital patient, Daniel, his family and medical/clinical teams have lived by for the past few years. Since his birth four years ago, eating has been an obstacle for Daniel. He was initially breastfed, but had difficulty latching and required supplemental bottle feedings that continued through toddlerhood due to his poor weight gain. As he grew, he refused spoon-feeding, became extremely selective with his foods and exhibited negative feeding-related behaviors such as spitting or refusal to sit at the table. Stella took her son back to the pediatrician who then referred the two-year-old boy to a gastroenterologist. His doctors diagnosed Daniel as “failure to thrive” amid various food allergies, reflux, constipation, asthma, feeding and speech delays, and autism. Upon recommendation by their family pediatrician, Daniel was admitted as a Day Hospital patient to Blythedale’s Specialized Feeding Preschool. This intensive program – coordinated through the Hospital’s Stavros Niarchos Center for Speech Pathology and Audiology - has received nearly 100 admissions since its 2014 inception; treating children that can eat, but won’t due to a variety of causes ranging from medical, to sensory, to other environmental factors. Rita Erlbaum Kotorac, CCC-SLP, Director of Speech Pathology and Audiology at Blythedale Children’s Hospital, remembers meeting Daniel at his outpatient evaluation two years ago, the first of his two separate program admissions. “He had a very limited diet and many negative or interfering behaviors surrounding mealtime activities in which he expressed that foods were not of interest to him because he wasn’t motivated by hunger,” she said. The Hospital’s specialized feeding team spent months trying to break down his negative desire to eat and disinterest in food, while simultaneously working to build up his interaction with food and eating to make it a pleasurable experience. Significant challenges resulted in a mutual agreement among clinicians and Daniel’s family that they take a brief break from the program. A few months later, a different Daniel returned to Blythedale Children’s Hospital. Doctors had successfully diagnosed him with eosinophilic esophagitis, or EoE, a chronic, allergic inflammatory disease of the esophagus (the tube connecting the mouth to the stomach) that can cause injury and inflammation, making eating difficult or uncomfortable. With this new knowledge and an in-depth examination of the foods that were causing him severe allergic reactions - namely eggs, fish, wheat, nuts, soy and milk - his medical team and mother worked on eliminating them from his diet in hopes of helping him thrive. 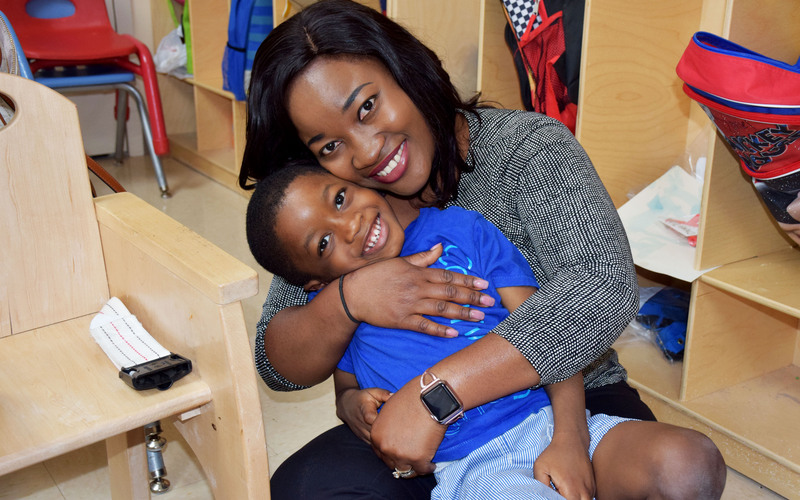 This past summer, Daniel’s goals had been reached with the expertise of Blythedale Children’s Hospital and he successfully graduated from the Specialized Feeding Preschool Program. It was also a proud moment for Daniel’s longtime social worker, who praised the work of his family and the feeding team. Daniel is now set to start a preschool special education program in his community that focuses on his ongoing development, a day his mom didn’t think would ever come.